Many a guitarist has emerged from their band in pursuit of a solo career, but scarcely has that move seemed so inevitable than with Belle And Sebastian's Stevie Jackson. Indeed ever since his contributions appeared on The Boy With The Arab Strap, the question on most fans' lips has been when - not whether - the Glaswegian would take his creative enthusiasm to its logical conclusion. 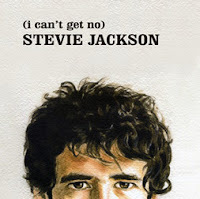 Now that (I Can't Get No) Stevie Jackson does exist, however, a more taxing set of queries has risen to the fore: Are its songs leftovers from his day job? Is he entirely comfortable taking the lead? And most importantly, has he learned from previous misdemeanors, some of which played a significant role in the Scots' late 90's early 00's decline? The answer regarding the latter is a resounding yes, but responses to those other two enquires are less easy to come by. Pleasing though it is, this is a record which springs few surprises. Fueled by Jackson's obvious adoration of 60's pop music, most of its songs are very much in keeping with Belle And Sebastian's recent outings - though that in itself is no bad thing. They tend to settle in modestly enjoyable as opposed to unequivocally brilliant territory, but even so there's plenty of material here that would have done Write About Love the world of good. Swaggering numbers such as 'Just, Just So To The Point' and 'Press Send' also suggest that Jackson is becoming increasingly confident in the front seat role. It may not sound like much, but it represents a real breakthrough for the 43-year-old, and clearly displays his progress since those subdued earlier compositions. Much of that headway can be put down to a stark desire not to repeat past errors, and that willpower plays a huge role in this record's success. Sure standards do drop a little towards its back end, but even then there's nothing lifeless and stale ala 'The Wrong Girl' or 'Wandering Alone,' the likes of which have previously depicted him as a distinctly limited songwriter. There are in fact moments here which not only provide evidence to the contrary, but completely blow that notion out the water. 'Try Me' for instance takes up a bouncy and direct tone which perfectly sums up the album's light hearted nature, while 'Bird's Eye View' goes about its business with a tender warmth we've not heard since 'Seymour Stein' and 'Chickfactor' first appeared way back in '98. Considering the background surrounding Jackson and his career in music, it's tough to judge this record without referring to past form. It's a fun listen no doubt, but the truth is that its appeal is unlikely to stretch far beyond his Belle And Sebastian fanbase, especially given its relatively low key release. Those existing followers will, however, find plenty of rewards here, and will no doubt savour the development of their man's talents. It's not an album that's going to gain rave reviews or prestigious accolades, but in the context of its maker's career, (I Can't Get No) Stevie Jackson nevertheless represents a commendable accomplishment. 9. Where Do All The Good Girls Go?